Academician Vladislav Vladislavovich Voevodskii (1917-1967) is one of the largest modern scientists in the field of chemical physics. V.V.Voevodskii was born on July 25th, 1917, in Leningrad. Upon graduating in 1940 from the Leningrad polytechnical institute, he worked in Institute of chemical physics of AS USSR. Vladislav Vladislavovich was one of the most talented disciples of academicians N.N.Semenov and V.N.Kondratyev. His scientific outlook has formed under their influence. The first works of V.V.Voevodskii deal with the principal questions of the theory of branching chain reactions. He has established the essential details in the mechanism of the reaction of hydrogen oxidation, and he has added the theory of cracking the paraffin hydrocarbons by a concept on the function of heterogeneous factors. As a result of the research into the structure and properties of free radicals, he has discovered a new type of radical reactions, specifically, a transfer of an active centre, based on which the first quantitative theory of cracking of olefinic hydrocarbons has been developed. Studying the processes of recombination of atomic hydrogen on the surface of catalytically active materials, V.V.Voevodskii has observed two types of the steady-state processes: low-temperature and high-temperature ones. He has determined the efficiency of recombination over the metal and oxide catalysts. These results and a body of theoretical generalizations have led to creation of the radical-chain view of the nature heterogenous catalytic processes. 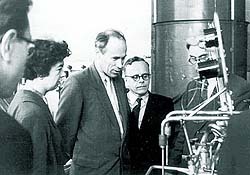 V.V.Voevodskii was among the first ones in the USSR who has understood the importance of application of radiospectral techniques, in particular, an electronic paramagnetic resonance method and nuclear resonance method in chemical research. Therefore, since 1955 the basic direction of his scientific activity became the research of the structure of properties and chemical transformations of free radicals in diversified chemical processes by means of radiospectroscopy. These researches have resulted in creating the Soviet school of chemical radiospectroscopy, which have won a world recognition. Vladislav Vladislavovich has arrived in Siberia already as a prominent scientist. In the Novosibirsk scientific centre, the talent of V.V.Voevodskii as the greatest scientist, teacher, and organizer widely developed. Here he became one of the organizers of the Institute of chemical kinetics and combustion of SB AS USSR (Siberian Branch of the Russian Academy of Science), the department of natural sciences and sub-faculties of physical chemistry, and molecular and biological physics in the Novosibirsk state university . 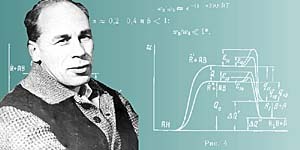 Scientific investigations supervised by him on exploring the mechanism of formation of radicals under the effect of light and radiation, on study of weak intermolecular interactions and their functions during the elementary acts of complex chemical reactions in the condensed phase have won the widespread recognition in the world science. He is considered to be one of the founders of a new field in science, chemical magnetic spectroscopy. The physico-chemical school developed by him presently has the advanced rating in the world science. The scope of scientific interests of V.V.Voevodskii was surprisingly wide, from the mechanism of reactions in the gas phase to chemical problems of condensed media, and in his last years, some questions of biological nature too. Vladislav Vladislavovich had a rare ability of prompt understanding the main essence of works even in those fields of chemistry where he was not an expert. Wide erudition allowed him to generalize a vast range of the diversified investigations, ideas, and theories. V.V.Voevodsky is the author of numerous reviews, monographs, and original scientific works. Much efforts and energy were given by V.V.Voevodsky to strengthening and expansion of the international scientific communication. He actively participated in the organization and work of many international scientific conferences, symposiums, meetings; he performed the public presentations in many countries with lectures and reports on the achievements of the Soviet science. V.V.Voevodskii did not live to 50-year age. the State premium of the USSR has come to him posthumously. Nevertheless, the conferences for his memory are conducted alternatively in Moscow and in Novosibirsk every five years. The street in Academgorodok is named after him, together with the international scientific premium, the premium for young scientists the Siberian Branch of the Russian Academy of Science, the grant for NSU students. His memory is immortalized on the memorial board on the building of the Institute. * Sources : 1) Kondrat'yev V.N. Uchyenyi, pyedagog, organizator // Za nauku v Sibiri. - 1967. - 25 iyulya (N 31). - S.2. 2) Pamyati Vladislava Vladislavovicha Voyevodskogo // Izvyestiya SO AN SSSR. Otd-niye khim. nauk. - 1967. - Vyp.2. - S.181-182. Dokumyent izmyenyen: Wed Feb 27 14:46:52 2019. Razmyer: 10,569 bytes.